Alright, not everyone will agree with me about dipped strawberries being better than gift cards, but they sure change up the gift giving game. And let's be honest, they are a pretty perfect gift for any occasion, be it Mother's Day, Father's Day, Valentine's Day, or Teacher Appreciation Day. When it comes to teacher appreciation gifts I never really know what a teacher needs. I know that no teacher NEEDS chocolate or strawberries, but I know that indulging in a delicious treat helps calm my nerves, and lets be honest, we are nearing the end of the school year. If kids are going crazy, teachers are too. If I were a really awesome blogger I would have written up teacher appreciation gift ideas in February, but I can't even be considered a blogger at this point. So, I thought I'd just share this for next time, or a last minute Mother's Day gift idea. 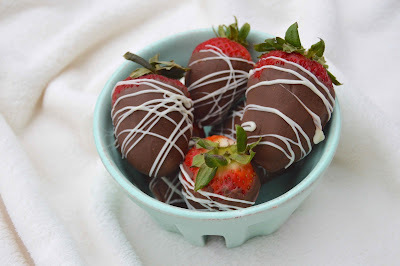 Chocolate dipped strawberries are easy peasy, so long as you can manage to find some perfectly ripe strawberries, and get your chocolate to a good consistency, they shouldn't give you too much trouble. So whip up some chocolate dipped strawberries, add a cute little note, and throw them in a berry basket. Done and Done. Last minute gift complete. First off, you don't need anything fancy. You can certainly use something fancy: fancy ingredients, fancy tools, fancy wrapping, but a few basic things will do. 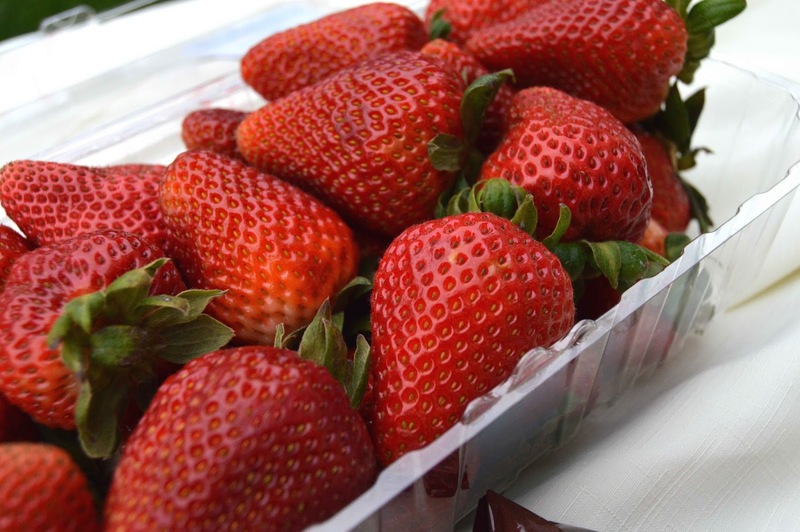 Start off by washing your strawberries. 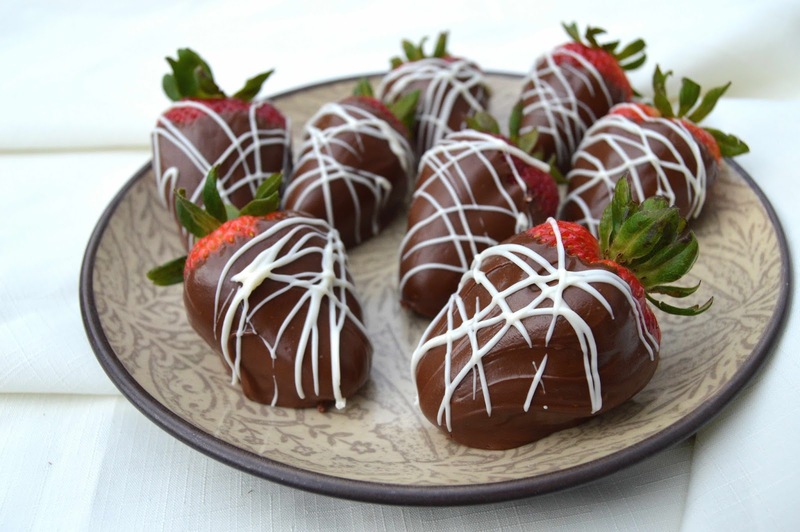 Leave the stems intact so that it is easier to dip the berries in the chocolate. Dry your berries thoroughly. I let them dry on a few paper towels, and then pat each one dry before dipping. 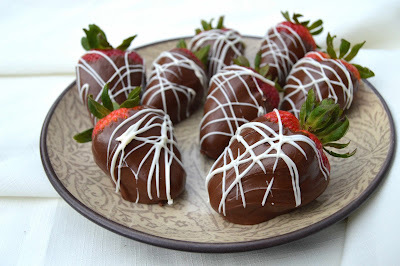 If you try dipping a wet berry it will repel the chocolate and cause it to clump up. Melt your chocolate. Now I used the cheapest brand name chocolates I could find (you're welcome teacher), but there are specialty dipping chocolates that you can find in stores that would probably work better. I melted mine in a bowl in the microwave. Start out melting it for 30 seconds, then stir for as long. Stirring will really help speed up the melting process, and ensure that the chocolate is heated evenly. If 30 seconds didn't do it, then add 15 seconds and stir again, continue until nice and smooth. Now, I've read several posts that say adding 2 tbs of butter will help make a smoother dipping chocolate. I did that. Guess what happened, it got thick and chunky. So, I broke the rules that my research had given me, and I added a tbs of shortening-magic I tell you. It was smooth and perfectly dippable, without having to reheat. 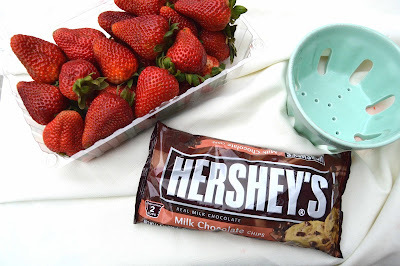 Once my chocolate was nice and smooth it is time to get dipping. 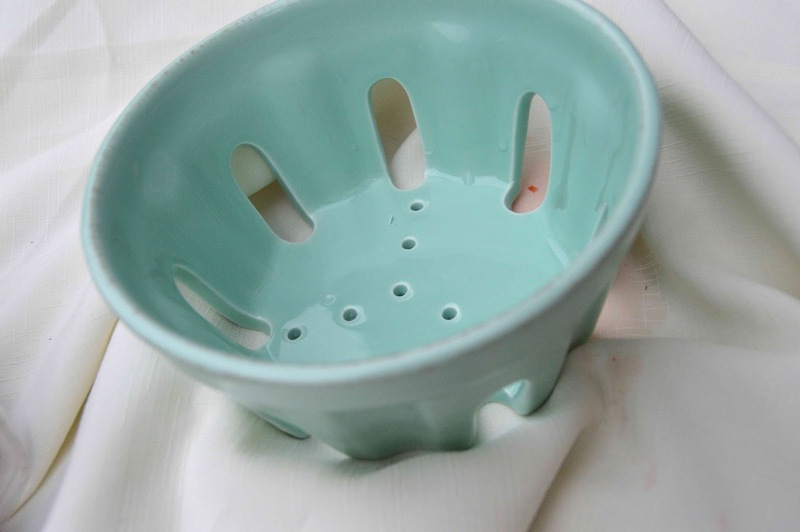 Ideally your dipping bowl will be small but deep, this allows you to dip without as much rolling from side to side. Go down in, pull that bad boy up, and then shake off, or swirl off, the excess. Place on tin foil or waxed paper lined cookie sheets to set up. 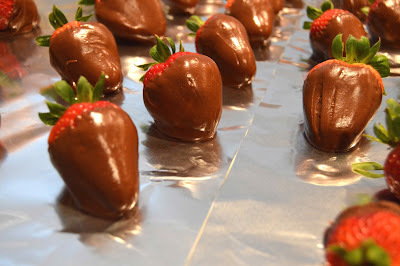 After the initial dipping process I melted some vanilla chips in the microwave, added them to a ziploc bag with the end snipped off (very small snip), and then drizzled haphazardly over the strawberries. Next, move those bad boys to the refrigerator. This allow the chocolate to fully harden, and keeps them out of reach of your children. An hour should be sufficient. Store in a cool location, but not in the fridge. 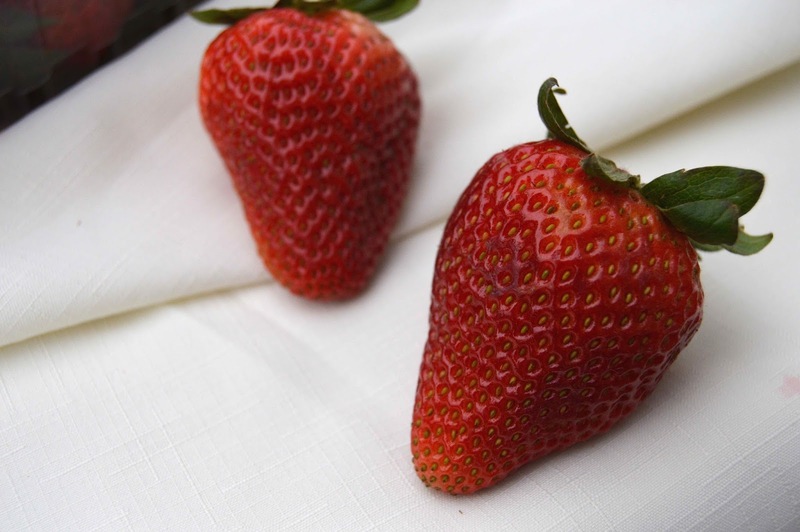 Refrigerating for too long will cause the wax to whiten on the surface of the berries. Next throw them in an adorable berry bowl. I picked this cute little guy up at Dillard's a couple of summers ago. It is the perfect size for berries and grapes. 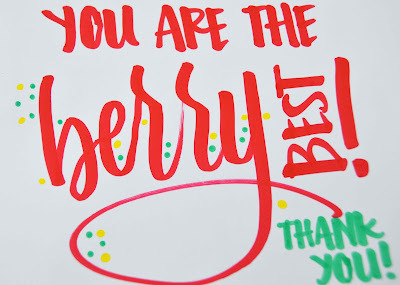 So, even after your giftee has consumed your delicious berries, they will be left with something pretty to remember you by. Ah, how sweet it was of you to make those for them. Indeed, here is the ideal arrangement, put resources into a ping pong instructional DVD. 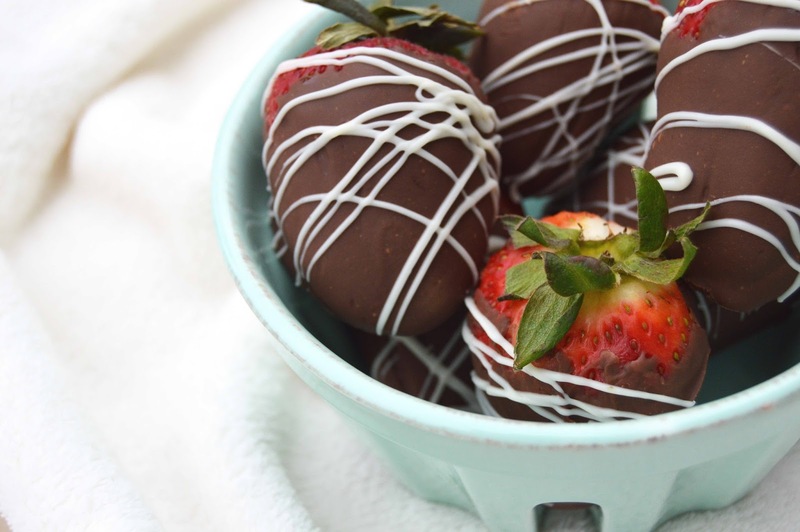 These chocolate dipped strawberries are looking mouthwatering. Pleased to have this recipe here. 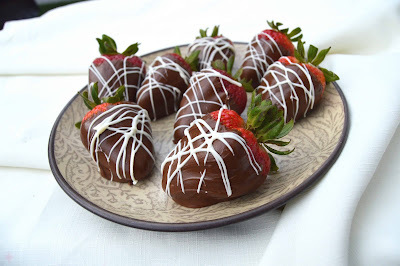 My cousin’s birthday party is coming up next month at a local party venue Houston and will love to make these chocolate dipped strawberries as party favors. Thanks for the idea!